more complete awesomeness from the beijing city department of traffic management. this time, individual animations describing how to navigate each and every highway interchange within the 5th ring road. Each and every interchange is designed differently making it virtually impossible to know how to navigate this literal urban jungle unless it is a path well traveled. 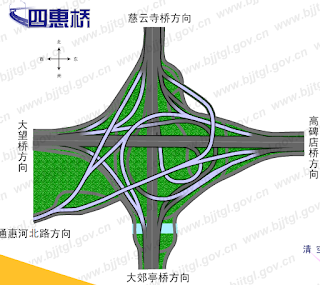 the map shows each and every interchange. click on any one to see it in detail. sihui qiao interchange is one that is particularly insane (and one which we have driven many times over after missing our intended exit). click on the different possible paths listed on the right hand side of the page and watch the poor little cars try to make simple turns. hours of good wholesome entertainment. whoopeee!